Leverage your existing investments in iPhone and iPad by deploying PowerTrack’s iOS applications to your mobile workforce. With advanced timekeeping, data entry and comprehensive configuration capabilities, PowerTrack can automate your timesheets and other reporting for your remote locations and job sites. There are two iOS application formats available. Our smartphone format operates on all models of iPhone, as well as iPad. It is the most flexible to handle a variety of field data collection requirements. It will display data entry forms that you can create yourself using the PowerTrack mobile forms builder. 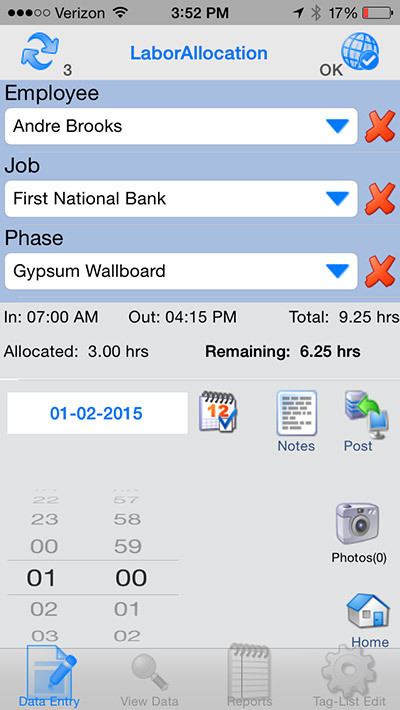 PowerTrack’s iOS applications are designed for ease of use and fast data entry. Data filtering and user’s tag lists keep selection lists short. Advanced features include barcode scanning and image capture using the devises’ integrated camera, signature capture, voice notes and GPS record stamping. Both iOS applications allow the user to review their data prior to submittal. Entered data can be edited by the user on the local device until submitted. Server-side reports can also be reviewed from within the iOS applications, which can be printed using an AirPrint printer or emailed using your default email application. One of the benefits of using Apple’s native Objective C development language is the ability of the application to work in a disconnected mode when the network is down. The user can continue to enter data and then submit their records when the network becomes available.